Ericmany Entertainment Presents the Bend down Pause Mashup Remix Challenge. This competition is targeted at producers and Dj’s, with a Cash prize if $10,000. 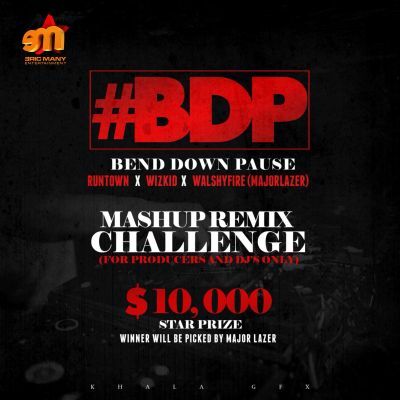 Make a mashup remix of RunTown’s hit track Bend down pause featuring Wizkid Walshyfire of Major Lazer. Post a 14-second video of you in the studio producing it on instagram with the hashtag #BDP then tag @runtown and @walshyfire. Send the full version to bpdmashupentries@gmail.com to qualify for an entry. There will be a total of 20 entries and the winner will be picked by Major Lazer and will win a $10,000 cash prize.